Sometimes you hear the perfect song at just the right time. Like, when you’re driving in your car and a song comes on the radio and you immediately turn it up because it’s THE song. You could swear that you wrote the lyrics because it expresses what you’re going through – then and there. I love it when this happens and I love it even more when it happens at church. Today, as I sat in church with my husband, I just wasn’t feeling it. Maybe I was preoccupied with other thoughts or the strong scent of after shave coming from the old man next to me. We were seated in a different section and it bothered me. I’m a creature of habit (for better or worse) and little things like that make my head spin. I know, trivial, but it’s true (and I’m working on it). Anyway, as we stood to sing, I was overcome with a sense of peace as I sang along to the song. It was one of my favorites and I hadn’t heard it for a long time. As I continued to sing, everything else faded away and I was right there, in the moment. Let me be your servant; let me walk your way. Guide me on your path; give night the light of day. Let me be a sure foundation, pure and strong. Let me tell of your salvation all life long. Give me ears to listen. Give me eyes to see. Give me words to speak and show your face to me. In silence, when you call me, let me hear your voice. Jesus, walk beside me; let my soul rejoice. When winds and currents batter me, help me be sure. Give me courage from the storms when they occur. Last night, when I awoke I heard you call my name. You refreshed my soul; I felt your burning flame. Oh, strengthen me to bear my cross and walk your way. Give me grace to comfort those with all I say. 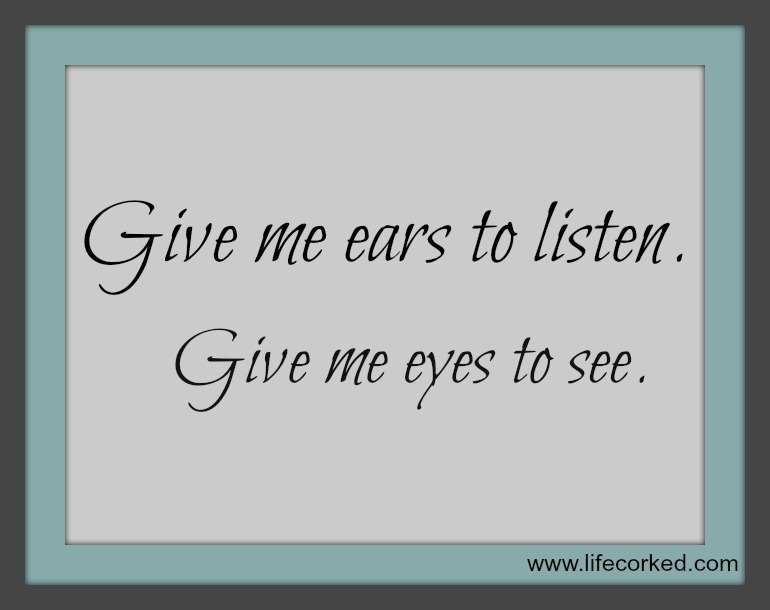 Please, God, always give me ears to listen – especially when I’m distracted with trivial things. Thank you. I’ve never heard that, but I love it! Your mom was a wise woman in many ways!